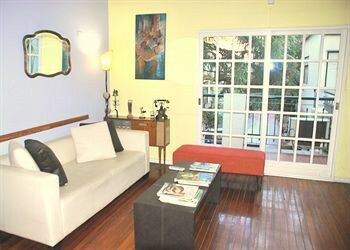 Property Location A stay at Caseron Porteno places you in the heart of Buenos Aires, convenient to El Solar de la Abadia Mall and Estadio Monumental. This bed & breakfast is within close proximity of University of Belgrano and Palermo Hippodrome.Rooms Make yourself at home in one of the 10 guestrooms. Complimentary wired and wireless Internet access keeps you connected, and cable programming provides entertainment. Bathrooms feature showers, complimentary toiletries, and bidets. Conveniences include safes and desks, as well as phones with free local calls.Rec, Spa, Premium Amenities Take in the views from a rooftop terrace and a garden and make use of amenities such as complimentary wireless Internet access. Additional amenities include concierge services, a television in the lobby, and tour/ticket assistance. Guests can catch a ride to nearby destinations on the area shuttle (surcharge).Dining A complimentary buffet breakfast is served daily.Business, Other Amenities Featured amenities include complimentary high-speed (wired) Internet access, a computer station, and luggage storage. For a surcharge, guests may use a roundtrip airport shuttle (available 24 hours) and a ferry terminal shuttle.